I have rather a lot of rhubarb plants; nine to be exact. You could say that it a little over the top, but then it does mean that I don’t resent using the rhubarb in sourdough muffins as a mid morning treat for my students. I also love that perfumed acid sweetness. It is irresistible, however I have noticed, generally that people either love or loath rhubarb in equal measure, so feel free to substitute the rhubarb for gooseberries or blackberries, or indeed any seasonal fruit. This recipe is one that uses up left over sourdough starter. The sourdough acetic acid reacts with the baking powder resulting in a lighter topping and I really like that light lactic acid tanginess that sits quietly at the back of this extra light pudding. 30 x 20cm tin or ceramic roasting dish. Melt the butter and allow to cool. Preheat your oven to 180°C. Prepare your roasting dish by lightly greasing with butter. Cut the rhubarb into 1.5cm slices and spread them over the base of the prepared tin. Whisk the eggs, caster sugar and vanilla extract in a large bowl until light and fluffy. Mix the melted butter with the sourdough starter and buttermilk and add to the egg and sugar mixture. Fold the flour mixture into the wet mixture together until you have a smooth, thick batter. Spread the batter over the rhubarb and sprinkle the flaked almonds over the top for extra crunch. Bake for 30-40 minutes, or until the sponge is golden brown and a skewer inserted in the centre comes out clean. Sit the dish on a wire rack to cool a little. Dust with icing sugar and serve warm with ice cream or clotted cream. 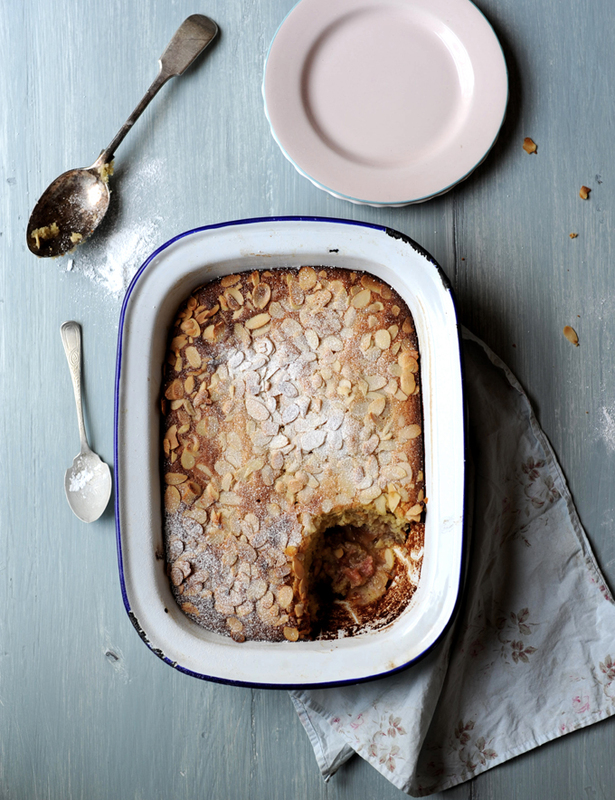 Share the post "Sourdough Rhubarb Pudding"
This looks good for a family pud. Meanwhile, workmates might enjoy the elevens’es rhubarb muffins you serve students. Do you have that recipe on the net Vanessa? Your recipes are always so tempting and deliciously creative. I love the sound of this. Thanks for this recipe. I made a couple of changes: I doubled the quantities of rhubarb (we do have a glut) and I used yogurt instead of buttermilk. But it worked very well and pudding was really light and tasty. Hi Sheila, Good substitute .. Glad you enjoyed it.